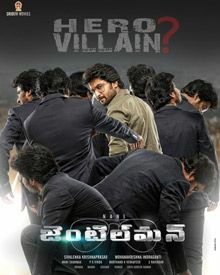 Gentleman is romantic thriller Indian Telugu film. It was released in 2016. Nani, Surabhi played lead roles. Niveda Thomas, Srinivas Avasarala, Anand, Tanikella Bharani, Pragathi, Rohini, Vennela Kishore, Satyam Rajesh, Rama Prabha played supporting roles. It was directed by Mohan Krishna Indraganti and produced by Sivalanka Krishna Prasad. Music composed by Mani Sharma.